Picnic Island,Forest Park, 12"h x 30"w, Oil on canvas, 2016. 0n November 29, 2012, a group of visual artists were guests of the St. Louis Symphony for a rehearsal at Powell Hall. They answered a call -for-artists sent out by Art Saint Louis, an organization that has been a center for arts life in the region for more than 25 years. The idea was for art to inspire art-as it did for Mussorgsky, and as it has done for artists even before anyone called what they were doing "art." Among the works that David Robertson and the orchestra rehearsed that morning were Thomas Ades's In Seven Days and Hindemith's Mathis der Mahler Symphony, two other works that were inspired by visual art and visual artists. You can see what the guest artists were inspired to create from that November morning rehearsal in Powell Hall this weekend. The St. Louis Symphony especially thanks Chandler Branch and Robin Hirsch of Art St. Louis, for helping make this partnership between music and visual art happen. 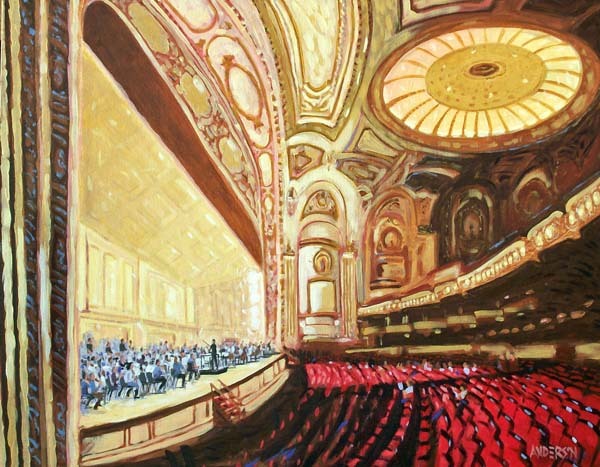 Pictured: Rehearsing Strauss, Michael Anderson, acrylic on canvas, 30" x 40"